Guess Who? 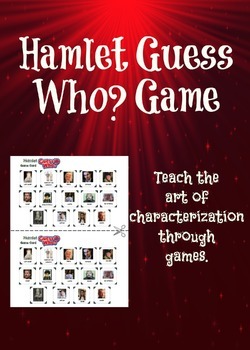 Game for Hamlet is a great way to familiarize students with characters. Included is a game card, the characters cards to cut out, and an instruction sheet. See preview for more details. The fun thing about this game is that the game changes as the reading progresses. It’s a great way for students to learn characterization and have fun at the same time. Spice up your Hamlet unit and incorporate a fun and meaningful activity.